Tarts have been around since the Middle Ages. Early tarts typically had savory fillings such as meat, while modern tarts are usually based on fresh fruit, sometimes with custard. Tarts are usually made with a buttery and a little crumbly shortcrust pastry base. A miniature version of the tart is called a tartlet. To celebrate National Raspberry Tart Day, indulge yourself with a slice of delightful tart or a tartlet with fresh raspberries from your local bakery. If you feel like cooking, you can make a raspberry tart yourself and treat your family and friends. 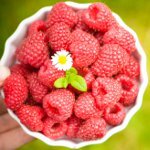 Here is a quick and easy raspberry tart recipe for you. In a bowl, blend together 1 cup all-purpose flour, 1/2 cup butter, and 2 tbs confectioners' sugar. Let the mixture chill for 1 hour. Pat chilled dough into a 9-inch tart pan. Bake at 375 °F for 10 minutes. Remove crust from the oven and cool. Arrange 4 cups fresh raspberries in crust. Heat 8 ounce raspberry jam in microwave or bain-marie until it begins to boil. Pour jam over raspberries. Cover the tart and put in the fridge for about 1 hour before serving.